If you are underweight and struggling to put weight back on by eating normally, your doctor or dietitian may suggest you have an oral nutrition supplement drink, as well as what you normally eat and drink. 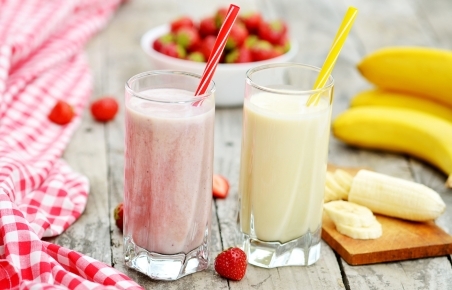 These drinks are rich in the nutrients you need, and will help you to have more calories. They are available as powders that you mix with water or milk, or as fluids that are ready to drink, such as Fortisip and Ensure Plus. Different types of powdered drinks are available and they come in different flavours. You can buy some at the supermarket and pharmacy (Complan, Vitaplan). You can get others (Ensure, Fortisip, Sustagen Hospital Formula) on prescription from your doctor or dietitian. Talk to your doctor or dietitian about what is best for you. You can mix the powder with either water or milk, but milk, especially dark-blue-top milk (whole milk), will give you more calories. It's best to have the drink between meals, so you don't become too full at meal times. Quarter fill a large glass or mug with milk or water. Use the scoop provided to measure the right amount of powder (either what's written on the packaging, or what your doctor or dietitian recommends). Mix with a fork or small whisk until the powder dissolves and the drink is smooth. You can use a shaker or stick blender if you want. Top up with milk or water, stirring continuously. Once the drink is mixed, you can have it straight away. You should cover any leftover drink and put it in the fridge and then use it within 24 hours. Add other flavours, such as milkshake flavouring, Milo, instant coffee, or drinking chocolate. Make a thickshake by adding 2 tsp of instant pudding powder. Make a hot drink by heating it gently – but don't boil it. ½ cup of frozen berries. If you've been prescribed an oral nutrition supplement, there might be times when you need to contact your supplier. This document has the oral nutrition supplement suppliers' contact details. It also has payment details in case you need to pay a prescription charge or a part-charge for oral nutrition supplements that aren't fully subsidised. Best Practice Advocacy Centre New Zealand Prescription Foods, special edition booklet.